The Milky Way is the name given to our home galaxy. It contains the Solar System, all the stars visible to the naked eye, and an estimated 100 - 400 billion stars in total. The name "milky" is derived from its appearance like a dim, glowing band that arches across the night sky and in which individual stars are not visible to the naked eye. The term is a translation of the Latin via lactea, from the Greek galaxías kýklos, or "milky circle". In many other ancient cultures, it was seen not seen as milky, but as a river, pebbles in the sky, flocks of birds and many other earthly features. 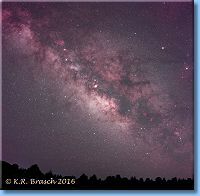 The Milky Way appears like a band across the sky because it is a disk-shaped structure when viewed edge-on from our earthly perspective within it. It was not until 1610 that Galileo Galilei first resolved the band of light into individual stars with his telescope. For a long time astronomers thought that all of the stars in the universe were contained within the Milky Way. It was not until the early 20th century that observations by Vesto Slipher at Lowell Observatory and Edwin Hubble at Mt. Wilson definitively showed that the Milky Way is just one of many galaxies in a much larger expanding universe. We now know that the Milky Way is a barred spiral galaxy some 100,000 – 120,000 light-years in diameter containing between 100 – 400 billion stars and at least as many planets. The Solar System is located about 27,000 light-years away from the galactic center, on the inner edge of a spiral-shaped concentration of gas and dust called the Orion–Cygnus Arm. A huge concentration of stars in the inner 10,000 light-year core form the galaxy’s center from which one or more bars radiate outward. The very center of the bulge contains an intense radio source named Sagittarius A* which is likely to be the site of a supermassive black hole. Stars, planets, gases and all other components of the Milky Way orbit its center at approximately 220 kilometers per second, even though their distances from the center vary widely. Since such a uniform rotational speed contradicts Kepler’s laws of orbital dynamics, this implies that the bulk of the Milky Way’s mass does not emit or absorb electromagnetic radiation. This mass has consequently been given the name "dark matter". It takes the Sun about 240 million years to go around the Milky Way center once. Our galaxy itself is moving at a velocity of approximately 600 km per second with respect to extragalactic frames of reference. Surrounded by several smaller satellite galaxies, including the Large and Small Magellanic Clouds, they form part of the Local Group of galaxies, which in turn is a subcomponent of the Virgo Supercluster.